This topic contains 5 replies, has 5 voices, and was last updated by Nasca 1 year, 9 months ago. Hello guys, first post on this forum so far. I’m here because I wanted to ask something about the french translation in the game. It’s almost good but that’s it : almost. There are some little errors and the translation is sometimes a bit… tricky and kinda lose the essence of the narration. Since I love this game, I wanted to help with it. Provided the narration in English and irs traduction in French, I would like to correct it. I’m not asking for anything in exchange. I just wanna help. 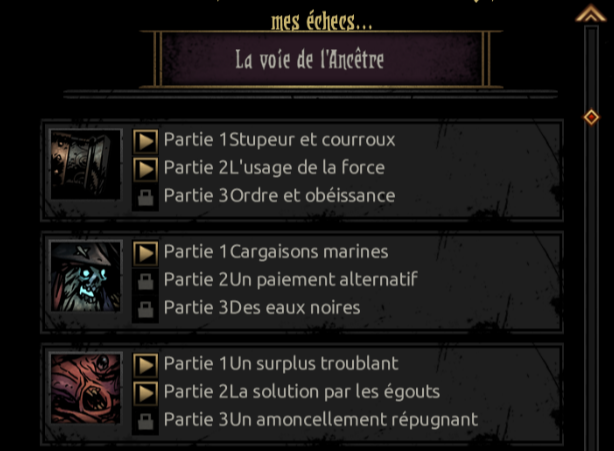 Head over to translate.darkestdungeon.com and create an account. You can submit lines for any of the strings in the game. We have a big update to the french loc planned for later this year, since much was re-written. It’s kinda nice even if I shake my self a bit too late to help but I’ll make sure to give it a look. However it has the correct name if I set the game in english. I’m using the Steam version of the game with all DLCs. I noticed an another translation error. I’m using the Steam version of the game with all DLCs. For all skill, “Mark Target” is translate by “Retirer l’étourdissement” and not “Marque la cible”.